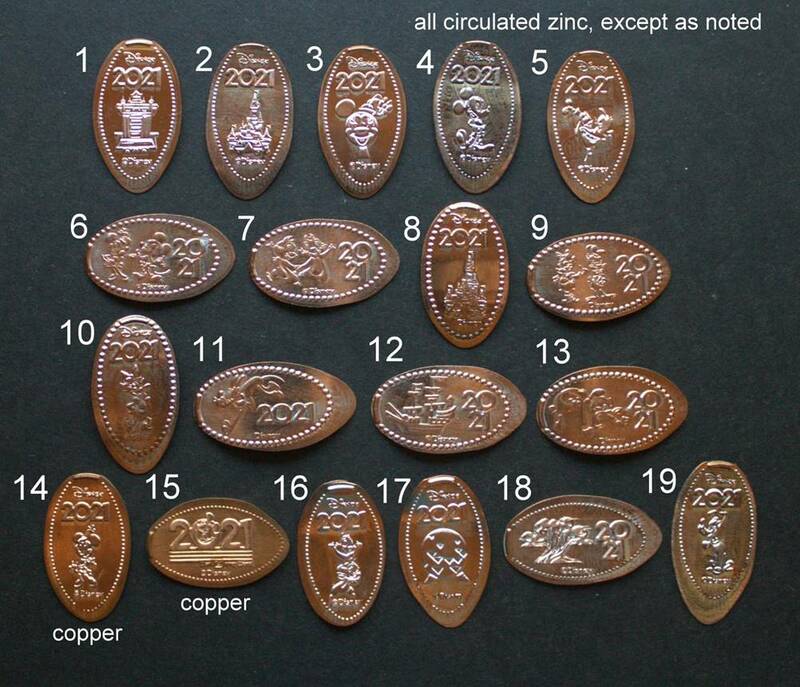 Although there have been prior series of coins with dates, the current dated coins began on January 1, 2011, when a penny was added to the machine inside the Emporium’s door. 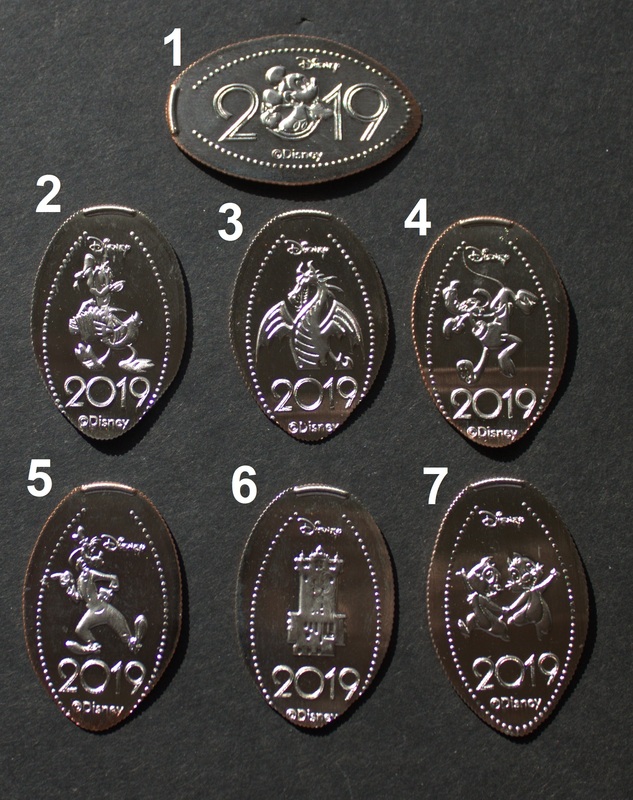 After that, the die at the Emporium was switched every January 1 to include a coin for the new year. In 2014 the idea expanded to 14 machines, and in 2015 it expanded to 15 machines. Photos show sample sets or concept art from the manufacturer. Your sets will be similar, but not necessarily identical. 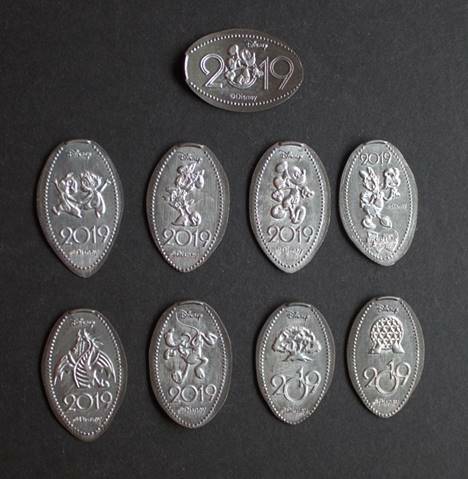 The other two coins in the Emporium sets were the “celebrating 40 years” design (which was retired in 2014) and "Let the Memories Begin” (which remains current). These designs can be rather busy, and it’s hard to make out the subject. The 2012 coin shows Mickey, Goofy, Donald and Pluto behind the year 2012; the second “2” is wearing Mickey Mouse ears. The design has Sorcerer Mickey in front with Donald, Goofy, Minnie and Pluto, and the number 2013. The Walt Disney World logo is on the bottom. 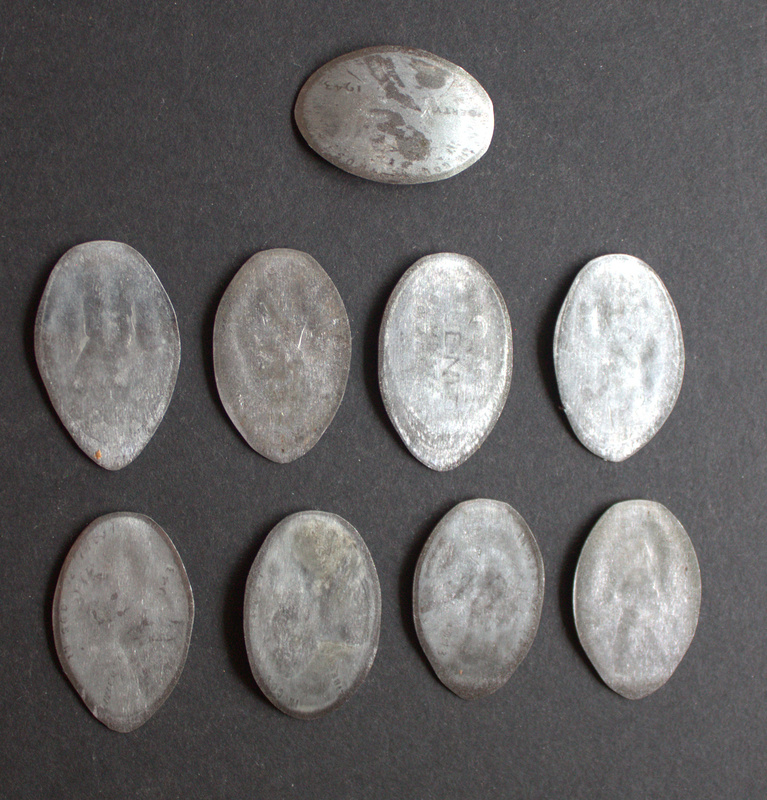 2014 was the first year for a dated quarter. 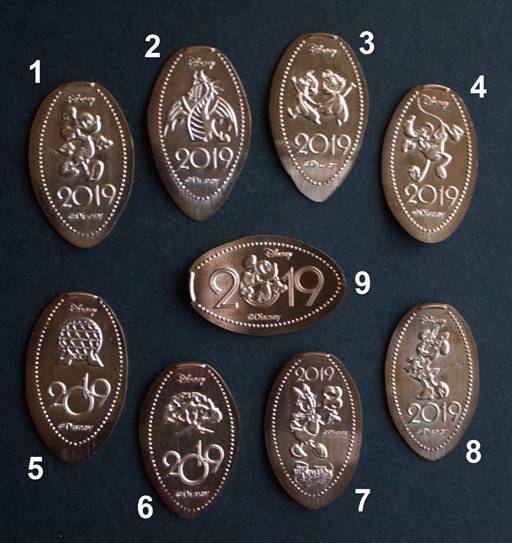 Also, for the first time, the dated coin was not limited to the Emporium store at the Magic Kingdom. Instead, to signify the “14,” there were 7 penny locations and 7 quarter locations. 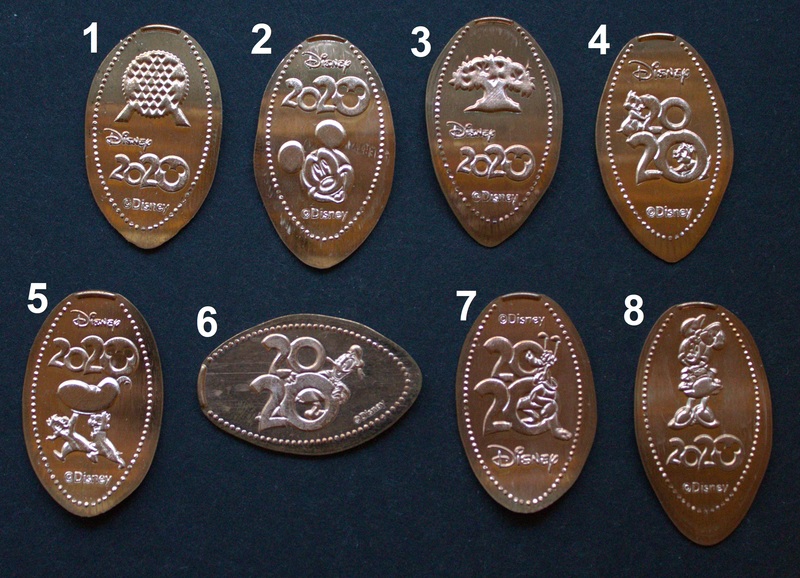 There were, however, only two designs: the penny design and the quarter design. While there may have been tiny differences at the various locations, no significant differences have been spotted. 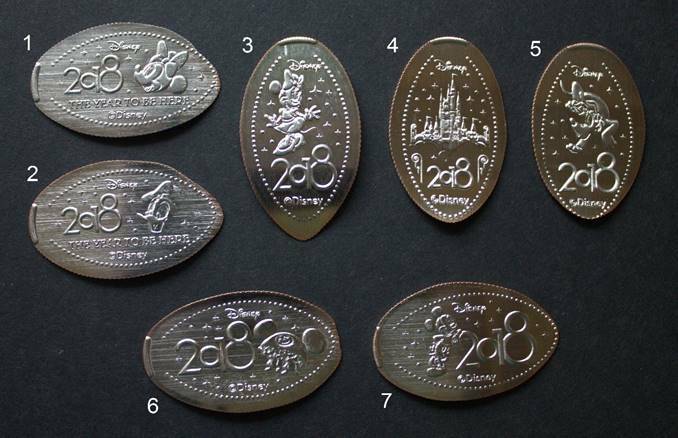 The penny has Sorcerer Mickey in front of 2014. The quarter shows Sorcerer Mickey and friends in front of 2014, with fireworks in the background. The 14 locations used in 2014 were repeated in 2015, but an 8th penny – giving 15 total coins was added at Splash Mountain. 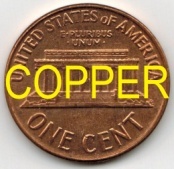 I am selling the pennies individually at $2.99 while supplies last. 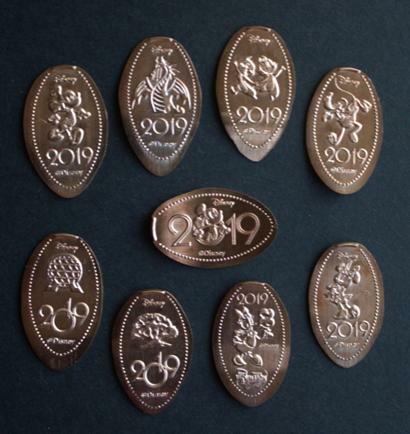 In 2016, there were 15 coins designs: 8 pennies and 7 quarters, at the same locations used in 2015. Individual coins are available, or purchase complete sets. 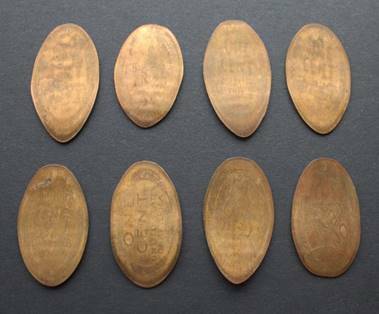 Because these are circulated pennies, they will have staining and flaws. The wheat stalks are visible to varying degrees on the reverses. Note: earlier version of this page erroneously stated the Donald coin was from All Star Music and Goofy was from All Star Sports. 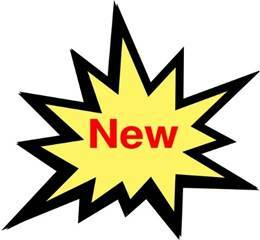 These listings have been corrected. 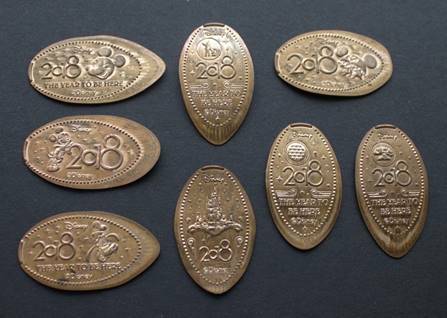 The 7th coin was supposed to be available at Hollywood Studios but was hidden behind a construction wall. It was eventually released at the All Star Movies resort.